For 15 years we’ve been calling for accountability and transparency in breast cancer fundraising with our annual Think Before You Pink® campaign. Last week we launched Knot Our Pink Ribbon, targeting The Estée Lauder Companies for their role in launching the pink ribbon. Join us and tell Estée Lauder to stop the betrayal. We’re still at it because they’re still at it. And because we know that grassroots activism works. Because of action from people like you, not only have we made dozens of corporations change, together we’ve changed how people think about breast cancer fundraising and pink ribbon culture. Change takes time, but we’re in this for the long run and we know we’re stronger when we raise our voices together. That’s why we need YOU to take action and send your letter to Estée Lauder today! Together we can end pinkwashing. And we can go a step further by challenging the pink ribbon culture that supports the breast cancer industry. Join us in calling out the original pinkwasher responsible for launching this toxic culture. 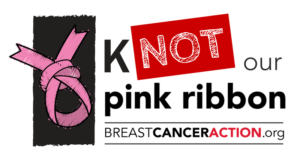 Tell Estée Lauder that their pink ribbon is “Knot Our Pink Ribbon” and help spread the word.